PBS Kids has released a branded version of the ScratchJr graphical programming development system for young children that runs on the iPad and Android tablets. Let’s back up a bit; first, is there a Scratch Senior? Yes, there is. It simply called Scratch and was developed at the MIT Media Lab Lifelong Kindergarten Group. It was first released in 2005 and is available online as well as for computers running Windows, OS X, and Linux. That version aims to give children as young as eight years old an entry point for programming concepts and practices. Endings: Ends, infinitely repeats, and goes to the specified page of the project. 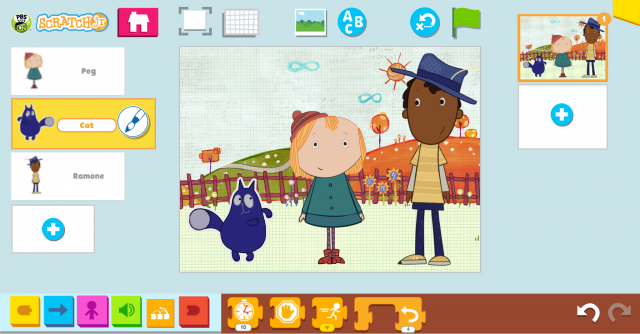 That brings us to the PBS Kids-branded version of ScratchJr, which “incorporates PBS KIDS media properties, including Wild Kratts, Wordgirl, Peg+ Cat, and the new series Nature Cat.” More than 150 characters are available for kids to use. The app’s tutorial video is wordless and textless, except for a few numerals required for programming timers. In other words, your child doesn’t need to know how to read or understand any particular language to get an introduction to user interfaces and programming. Each character in a scene can be programmed independently. It is literally an introduction to object-oriented programming concepts. PBS Kids is encouraging local PBS stations, schools, and other organizations to use PBS Kids ScratchJr to expose young children to programming concepts while having fun during Hour of Code and Computer Science Education Week (December 7-13). You can watch some Hour of Code workshop tutorials here. The apps for iPad and Android tablets are free and available from the Google Play Store and iTunes, respectively. There are no free or paid add-on for the apps.